Yoga is much more than just a physical exercise. It is a seamless integration of physical, mental & spiritual fitness. In short, Yoga is an attitude towards life as a whole. And restricting Yoga to the physical level makes Yoga very very incomplete. Even though physical component is a very important. An understanding of the bigger picture of Yoga and it's eternal relevance to humanity has to be established carefully through a systematic teaching of Vedanta. 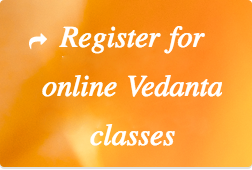 Vedanta is the final portion of the Vedas comprising of what are called the Upanishads. The Upanishads talk about the nature of oneself (Atma/Soul) and establish that the truth of the individual, outside universe & God as one and the same. This understanding is purely cognitive. Yoga, a Sanskrit word, also means union/oneness. Hence Yoga and Vedanta are not separate from one another but in fact are one and the same. The teaching of Vedanta also has been coming down for generations in the form of Guru (teacher)/ Sishya (student) tradition. And it has been carefully preserved completely to the present day. This teaching also has to be handled by a competent teacher who has been exposed to the teaching for a length of time. Appreciation of Yoga is also incomplete without understanding the culture, value system of the society in which Yoga originated and thrived. In fact the first 2 steps (Yama and Niyama) of Ashtanga (8 limbs), of Patanjali Yoga Sutra, deal with values and attitudes. Equal importance was given to the Yoga of both the body (Hatha Yoga) and the mind (Jnana/Vedanta/Spirituality). Asanas/pranayama were taught in the traditional Hatha Yoga way. The course included about 4 hours of Hatha Yoga (Asanas & Pranayama) along with 2 classes every day in Vedanta/Yoga Sutra, 1 class on Chanting prayers in Sanskrit with a detailed overview of science of phonetics (sound production of Sanskrit alphabets), 1 satsang in the evening that included some stories from the Mahabharata, singing of bhajans, meaning of certain forms like Dakshinamurti/Ganesha, certain assorted topics on Indian culture and Question/Answer sessions, every day. There were also some sessions on the anatomy of the human body (by a professor of Anatomy) with particular reference to Yoga. In the 30 day course the first 2 weeks were devoted to teaching various postures (asanas) and breathing techniques (pranayama) of Hatha yoga. The third week was spent in alignment (perfecting the postures) and adjustment (helping fellow students perfect their postures). The fourth week was utilised for making the student into a competent teacher. Classes on Yoga anatomy were also held. Trips to nearby spiritual/religious places will be organised on weekly holidays. The course faculty included Swami Sarvananda, Sanjeet Prasad and Swami Viswatmananda. The course was certified by Yoga Alliance.